The author wrote a book of wisdom inspired by insights from the world’s major religions, philosophy, mathematics, and science. A book for today, a book for all days, a book for everyone. 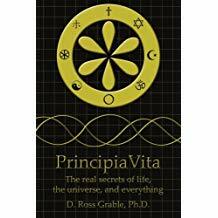 PrincipiaVita: The real secrets of life, the universe, and everything (AuthorHouse; 2006) by D. Ross Grable, Ph.D. is a philosophy book, where the author attempts to answer the greatest questions and issues of the modern age. This he did by digging deep into the scriptures of major religions and finding common ground between religions, philosophy, and the sciences. To use PrincipiaVita, the reader has to play the I Ching game in order to select which section to read. This is done by tossing a coin six times to select a pattern called a hexagram, which serves as an index of the book’s topics. The hexagram is composed of strong (representing heads) and weak (representing tails) lines drawn one above the other until there are six lines. The author explains how to best use the hexagram for this book in a special chapter. Watch out for the public display of this mind-blowing book at the upcoming 2018 Miami Book Fair on November 11-18 at the Miami Dade College’s Wolfson Campus in Downtown Miami. Written by D. Ross Grable, Ph.D.
A computer scientist, teacher, author, musician, published poet, philosopher, and father, Ross Grable has been writing this book all of his life. Raised in a conservative Protestant home, he asked the question, “Why should one group of people be singled out by God to receive the message of truth?” As a student of engineering, physics, mathematics, and computer science he asked the question, “How do things know how to be what they are?” The search took him through experiences as a computer technician in the U.S. Navy, a high school teacher, a Buddhist monk, a back-to-the-land commune dweller of the sixties, an Army researcher, and a college professor. He wrote a technical textbook on the characteristics of information to collect his thoughts. Grable had played with the idea that information was the forming and formulating power of the universe. He realized one day that, when the Bible said that God spoke and the universe was created, there was a deeper than obvious truth. All of the rest was just a matter of how to write it down. Today Dr. Grable lives with his wife Harriet in the wooded mountains of southwestern Virginia and teaches computer science, Renaissance music on recorder, and this book at the University of Virginia’s College at Wise. He and Harriet play together in several early music ensembles.